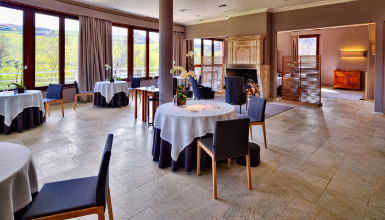 In a modern farmhouse overlooking the countryside, Martín Berasategui proves himself to be a genius of cuisine, making avant-garde signature cuisine, full of surprises. The restaurant has its own vegetable and fruit garden. Glazed dining room with widely spaced tables and Provençal decoration. Excellent desserts. Impeccable service. Its cellar includes almost all the Denominations of Origin. Cigar choice and spirits à la Carte.